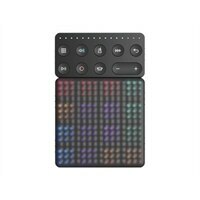 ROLI Beatmaker Kit - MIDI controller - USB, Bluetooth - 225 drum padsBeatmaker Kit gives you everything you need to take your beats to the next level, whether you're making your first track or honing your technique. Learn finger drumming skills, play with hundreds of expressive sounds, and complete your track with a suite of software. It's an all-in-one package for making beats, wherever your musical ideas strike. Beatmaker Kit gives you everything you need to take your beats to the next level, whether you're making your first track or honing your technique. Learn finger drumming skills, play with hundreds of expressive sounds, and complete your track with a suite of software. It's an all-in-one package for making beats, wherever your musical ideas strike.